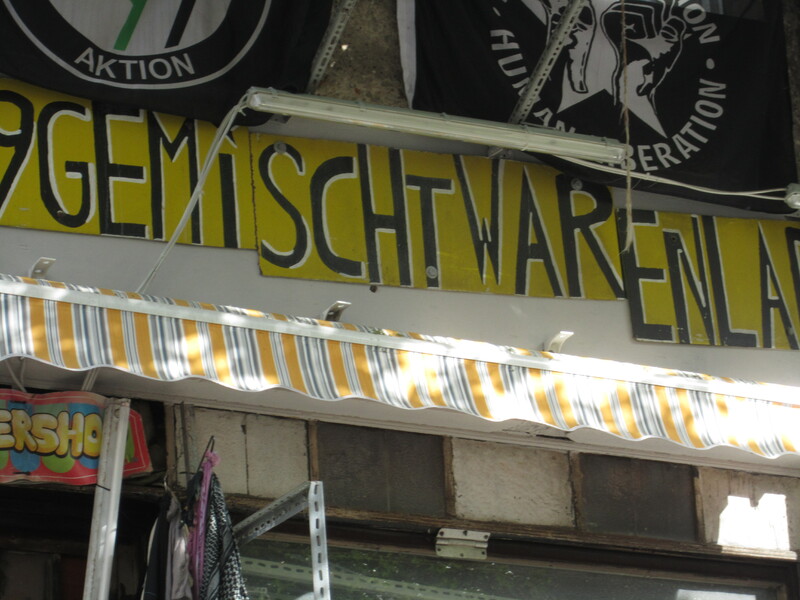 I went back to the anarchy bookstore (as I call it) in Kreuzberg yesterday afternoon. It’s one of the strangest places I’ve ever been to. Not overly scary. Just out there. My Dad would not be happy to read this. I’ve done worse, tho, Dad, so don’t worry. The walls inside at the anarchy bookstore are crawling with black hoodies, T-shirts, and ninja masks. That’s the best way to describe it. Very dark and claustrophobic. Punk teenagers go there to buy stuff for the antifa protests, I guess, based on the few young boys who came in while I was there, and seeing what they bought. Punks here in Berlin these days are unlike U.S. punks, and regardless, with my light green skort and J-41 sport shoes, I was certainly unlike anything they’ve seen there before. Cultures, collide! As I entered the store, the owner/manager said something to me in German, and I said, “stickers, aufkleber,” and he let me inside. 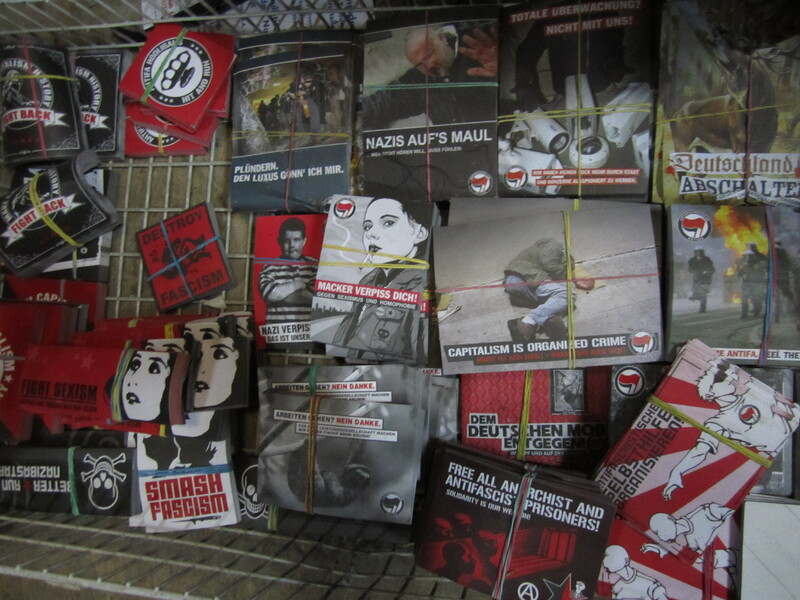 In one corner crammed full of stuff, there were boxes of antifa stickers. I worked my way in and thought, “There is not a single human being who knows where I am right now.” Sometimes, that’s alarming. Sometimes, it’s comforting. The person who runs the shop is handicapped, I believe, possibly from an accident. He was outside in a wheelchair when I got there and then all of a sudden appeared next to me inside trying to get up to a scrap of rug where he sits and runs everything. “Ten cents a sticker,” he said. I selected about 40 or so, with a few dupes for friends. At the time, the man was talking to one of the young punks and then started singing as loudly as he could, making up sounds and words that made no apparent sense. He was trying to get my attention. I kept my face buried in the box of antifa stickers. I finally went to pay for the stickers and must have said something in French, b/c the guy then started speaking in fluent French. When I asked, he said he knew five different languages (and probably more, given what I had witnessed). It was surreal. I give the guy a lot of credit, though. I also gave him my business card. I’ve been to this anarchy bookstore three times, and each time, it reminds me of the scene in “Apocalypse Now,” in which Marlon Brando sits in a dark pool of water, affected yet disaffected by what is going on around him. More to follow tomorrow. Kit Kat is off to sleep.